Having a Social Media Strategy will help you incrementally build loose individual relationships into brand loyal fanatics, it’s simply a question of time, effort and planning. Balancing the social needs of the consumer with the goals and interests of the institution. 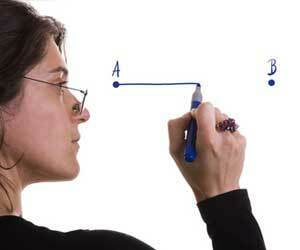 The question is how do you do it effectively and how do you prove your results. You can jump start the process here. We’ll explore how a higher education institution develops a Social Media Plan, how a cohesive strategy extends beyond the actual web sites in use, and how to measure the work being done. When I’m looking for a place to write, I drive half-way across town to the coffee shop I like. There are five others on my drive, but I really like the Baristas and the atmosphere. Plus there is a smoke free upstairs (Awesome!). My loyalty to what they have to offer, or their brand, keeps me coming back even though they aren’t the most convenient. We all have the ability to develop opinions like this, about the brands with which we interact on a regular basis, and the ability to develop these opinions online is becoming the norm. The conversations revolving around your brand already exist. Some institutions are reaching out. some are trying to figure out where to start, what’s legal or how to incorporate other messaging. Higher Education Institutions are different than other B2C Companies in that they serve a diverse group of constituents and have business drivers in multiple-silos. Some might say that these drivers are even in different industries; entertainment, athletics, service, sales, etc. Creating a strategy to deal with this diversity is a complex task. Focus on the goals of the institution. There’s no way to implement all of them in the time allocated by the organization. So focus on the top three or four and the move down the list. For example, are you trying to attract gap students, move ticket sales, improve the employment ratio of graduates, or is enrollment up 30% forcing you to work on development to offset discounted tuition? In each scenario your strategies will have different components to balance the generation of loyalty with the ROI from your work. Establish appropriate practices, usage policies and content parameters, but do it with the thoughts of the constituents in mind. For example, when you’re outlining content parameters, define up-front that every Facebook post will carry “~firstname” of the poster at the end of the comment. It gives the reader someone to connect with. Identify how each of your target audience groups is most available to you via Social Media and also identify how they want to connect with you. For example, LinkedIn is a great resource for developing Alumni Relations and reaching out from Employment Services. Part of this process will be overcome by understanding the culture of your institution and addressing the balance between communicating through approved channels and allowing staff and faculty to operate independently. Your legal department will have helpful input on this topic and so will the separate departments. Remember though, at the end of the day, this is not a democracy. 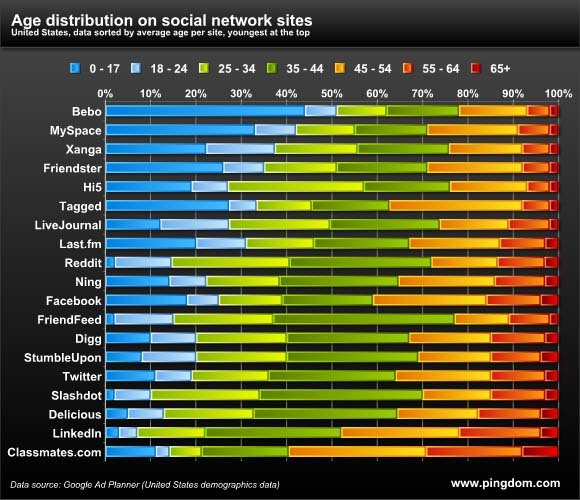 Age Distribution on Social Network Sites. Originally posted on http://royal.pingdom.com/2010/02/16/study-ages-of-social-network-users/ Feb. 16th2010. Re-Posted with permission from Aron Lander, Pingdom. A cohesive Social Media Strategy extends beyond the actual web sites you use. There has to be a logical progression from off-line and on-line marketing messages & collateral to the social media sites and back to the institutions closers: Admissions, Sports Marketing, Event Marketing, Alumni Relations, Development, Employment Services, The Book Store, Faculty, Student Groups and others. Ironically, last week I was having two conversations on Twitter, one with @KarlMiller and one with @UT_CoE(University of Texas, College of Education); turns out they were the same person. I just didn’t know it yet. Karl is working with a small group of twitterers (2.5) who have broken their followers into several lists for following and they build content from the ground up, post on Twitter and link it back to Facebook via Hootsuite. Butler University has a group of student bloggers including the young lady who cares for their mascot @gobutleru. Spreading out content development to these groups livens up the conversation and helps to engage your audience. Developing content is always a bear to overcome. Pay close attention to your expected frequency of updates and think about assigning content creation to a specific individual or group who will be your primary brand evangelists. This is one point that is very important, keep the content coming or your fans will migrate away. As I just mentioned, many institutions designate Student Bloggers for Admissions related content. It’s my belief that you should have very minor restrictions on the content they publish. For example, let them blog about last nights Greek event and all the parties splendor, consider leaning toward complete freedom instead of restriction. Belive-a-bility comes from honesty. Though I personally would advise bloggersnot to use F-bombs and try to limit other swearing. That doesn’t play well, even with students. Staff and faculty can contribute as well. Reach out to the school’s Development, Alumni Relations, Career Services, Sports Marketing, Event Marketing and student organizations to become second tier Brand Evangelists and content creators for your institution. They are very believable. Here’s a statistic that I pulled from The Social Media Revolution on YouTube: 78% of consumers trust peer recommendations, only 14% trust advertisements. Firewalls can be a major roadblock to Social Media Strategies. If your IT/IS Department has blocked access to Facebook, Twitter, LinkedIn, or any of the other platforms you have identified, your integrated Social Media Strategy could come to a screeching halt. Typically, firewall settings can be adjusted for approved users. If you are not high enough on the food chain to request these modifications, speak with your supervisor, Dean, or a Vice President to see what can be achieved. If you can’t find a solution internally send me an email for some ideas. Another key component you should address is lead management. How will you inject data from your campaigns into your CRM, ticketing, Brand Management, or University Management System? Banner, Jenzabar and Blackbaudall have the capability to accept data from third party applications. Typicallythese can be set up with automatic processes where appropriate, including the delivery of automatic email, direct mail, pURLs, SMS, and other auto-responder technologies. I’ll be posting a separate BLOG post on this, specifically on our upcoming application, FanTools for Facebook which is now in its second beta release. This is not a creative intense process, but I thought I’d share some common points. Default Facebook FanPages provide for one Graphic on the wall. This can have a maximum of 200 * 600. Use all of it if to reinforce you branding. I like adding welcome pages for people who have not seen your Fan Page before. You can add these through Static FBML. LinkedIn gives you room for two graphics one at 100×50 pixels, and another at 60×30 pixels. Twitter icons are 128 *128 pixels. I’ve seen animated gifs, but be careful in how you would represent your brand. The institution more than likely has a style guide which would be a great place to start. If you’re in communications or Marketing, great, you have easy access to all the right tools and talent. If you’re not in this department, contact them for assistance. The requests you’re making for these sites will be easy for a good graphic designer to fulfill. Not only do you need content, but you need to actively engage the people who you attract, or you will lose them. Many Social Media Professionals will tell you that your brand should only speak with the company voice. This runs counter intuitive to what I believe Social Media is all about. Say Hello to your constituents, ask how they are doing, add “~Julie” or “~Donna” or “~Bob to the end of every post from the Brand so people have someone to connect with. You should also identify and utilize the #tags that exist around your brand on Twitter and plan how to use them. One common strategy is to create live #tag discussions with alumni or discuss your teams current rankings or to set up faculty information exchange sessions. Tap into LinkedIn Groups to post discussion questions about how to improve your Masters programs or capital campaigns. You’ll quickly receive feedback from this highly engaged professional networking group. Post information on your FaceBook FanPage by utilizing the discussions app and the status feature. Ask your fans for feedback and show them you care about what they have to say. Some of the feedback you receive will be negative. This is a great opportunity to start a conversation to rectify the issue. Establish guidelines for response before your first “neg hit” and pay attention. You’re now in a 24 hour marketing cycle. Create frequent contests and special campaigns in which fans, followers and Group members can participate. Reward them for their participation with social or monetary incentives that align your brands with their interests. Photo contests are easy to implement and a great starting point. Use the program Static FBML we mentioned earlier in your Fan Page and take advantage of new tabs. Build fun interactive experiences for follower and potential fans that will not only help you create exposure for your brand and collect huge amounts of demographic data but will also give added value to the users who install or use them. Take re-ignition to an “even burn” by increasing your exposure. Creating a strong presence may look easy but it takes planning and tenacity. Just like any social group, individuals have needs, thoughts and opinions. You are responsible for keeping the interest of the group and growing it. Facebook and LinkedIn both offer advertising. I highlyrecommend it. You can easilyprovide your brand with around 30,000 impressions per day for $.30(CPM) or around a hundred dollars a month on Facebook. LinkedIn is more, starting at $3(CPM), but it isn’t going to break the bank. Each department will have their own budget so understand each departments reasongfor using social media and use that as justification for spreading the investment around. In the end, understanding each department’s needs and helping them balance their goals with their budget will bring the institutions forward, on-time and on-budget. Utilize Facebook’s Insights, Twittercounter, TweetDeck, Hootsuite, onClick Tags with Google Analytics, bit.lyor tools like these that you are comfortable with. If your organization has Omnitureor another Campaign analysis tool, plug every part of your Social Media Strategy into it. You’ll need to be able to understand and describe the success of you program withstatistics. Learn how to connect the dots between the number of interactions your Social Media Strategy is responsible for developing and what that effort has generated in real dollars. Start with the obvious; how many fans, followers and group members did you acquire each week, how many people commented on your posts, where are your fans located? Are they mostly female or male? The answers to these questions will of course enable you to make better use of your Social Media Plan of future activities. If you are pursuing more solid analytics, direct links can be made between advertisements, posts and other content to micro-sites and other tools designed to close on-line or automate the follow up and hand off leads to closers in real-time. Especially when the prospect is specifically looking for ways to use the services you provide. When they give you permission to contact them, make sure that the content is relevant and timely by hooking your email and direct mail solutions directly into the campaigns. I considered attending Western Michigan University’s Imaging Program before the idea of dynamic email, variable printing or Social Media was mainstream. I looked at the program favorably because my Uncle had a great experience with the curriculum and I liked how he described the instructors and the hands on learning. People in the community spoke well of the program, so I added it to my short list. I would have never considered the program if I hadn’t heard of it from my social network. The fact that Social Media has moved relationships like this on-line and that these relationships can drive interaction out to millions of consumers with a little planning and a well educated staff brings me back to my original point. We all develop unconscious loyalties to brands through social interactions. If you plan your work following these 8 points, you’ll be well on your way to creating the Definitive Higher Education Social Media Strategy. I have an easy to follow workbook that you can use to walk through this process. Send me an email, twit or post a request on our Fan Page and I’ll send it over to you. In my next post, I’ll be covering Brand Management and Marketing Automation Solutions, discussing what they do for Institutions who already have CRM and UMS systems. Let me know if you have any thoughts on the topic. Great post! I am always telling people that they have to have goals and measurable outcomes when they use social media. You are absolutely correct, you must have a purpose… a “social media raison d’être”. Thanks Eric. I like the way raison d’être sums up the point. Well said. Previous post: Social Media Strategies are for Losers!